The Basílica Menor y Convento de Nuestra Señora de la Merced is a religious building in Peru which was built by Fray Miguel de Orenes in 1535, taken by the holder to the Archangel Michael.In the Basilica is dedicated to the patron of the Armed Forces of Peru. As old as the city of Lima are the Convent and the Church of La Merced. According to ancient chronicles state that the land on which is built the Convent and Church and belonged to the Mercedaria order. It happens that the April 13, 1534, Captain Francisco de Becerra donated to this lot, plus six thousand pesos to the Convent of the Nativity of Our Lady, which later was called the Convent of the Mother of God of Mercy. In the preparatory Crypt beside the sacristy, are the graves of the famous donor with his wife. The Mercedarios is one of the religious orders that came to catechize the conquered peoples in Peru. A year before Francisco Pizarro, down here, while the founder of Lima was Cusco and Jauja. 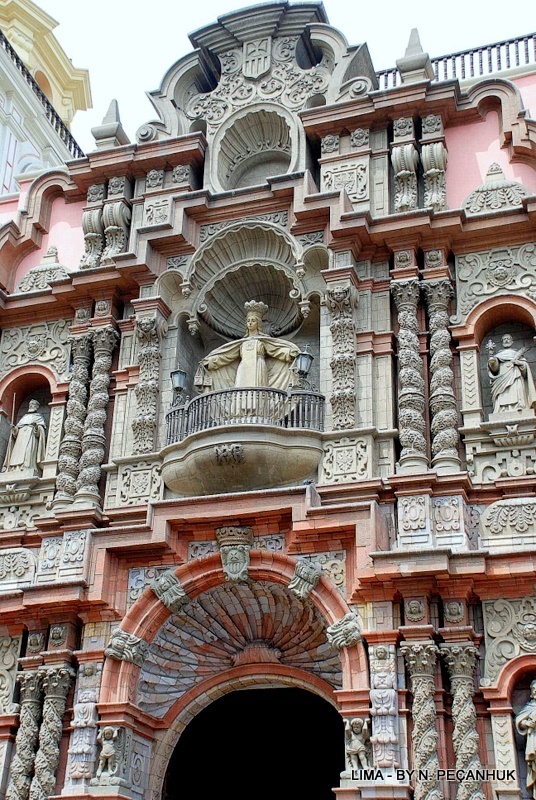 The first church was wooden, the current is the second, made of adobe and brick, its baroque facade was carved in 1591 by Cristóbal Gómez.